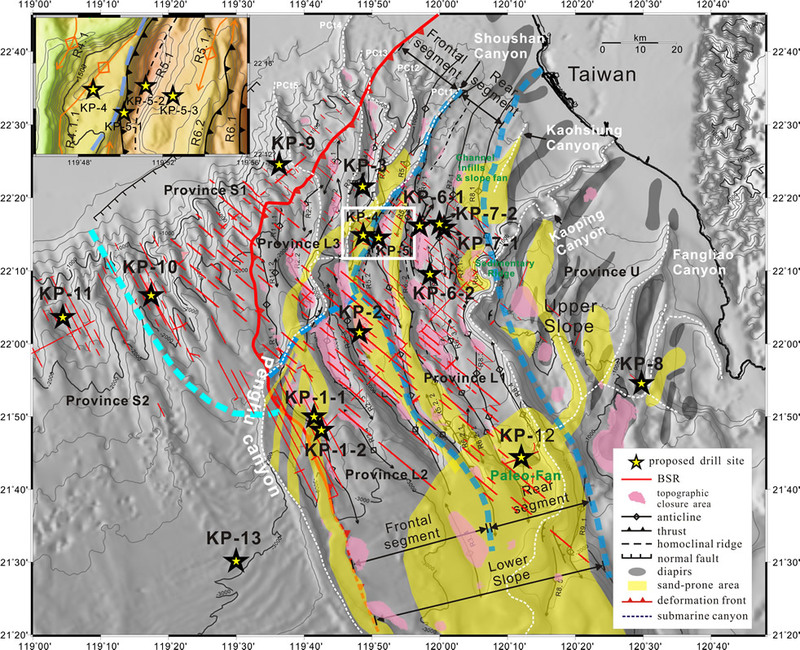 Seismic reflection data and geochemical studies on seafloor sediments off SW Taiwan reveal typical features for the existence of gas hydrates in the deep-water sediments. Gas hydrates have been widely regarded as future energy source once the conventional oil and gas fields around the globe are depleted. Past studies also found that the releasing of gas from gas hydrate-bearing sediments may cause global warming and it poses a natural hazard for generating submarine landslide that may in turn generates tsunami. The Central Geological Survey (CGS) has, therefore, carried out an integrated program since 2004 in a bid to characterize both the geological and geophysical signatures of the gas-hydrate bearing sediments. This study is one of the joint programs funded by CGS and coordinated by Prof. Char-Shine Liu at National Taiwan University. Our group is responsible for analyzing the seismic data and synthesizing geological and geophysical data to understand the gas hydrate petroleum systems, play types and prospect in the study area. Using seismic reflection data, we aim to understand the subsurface structures and sedimentary features of gas hydrate-bearing sediments. In addition, we mapped out the spatial distribution of gas hydrate-bearing sediments from the characteristics of gas hydrate bottom simulating reflectors (BSRs). BSRs are seismic reflections that mimic seafloor relief and commonly cut across reflections originated from bedding planes. We recognize six distinct hydrate-bearing provinces off SW Taiwan on the basis of tectonic features, spatial distributions of BSR, inferred types of gas-bearing fluid conduits, and seafloor geochemical/geological anomalies related to methane seepages. We then propose 18 drill sites selected from 13 representative prospects. The drilling strategy is designed to understand the spatial variability of the gas-hydrate reserves, fluid and gas budget, lithology, and the geological controls on gas hydrate and free gas occurrences both across and along the accretionary wedge and the rifted continental margin of the South China Sea, respectively. Lin, A.T. , Liu, C.-S., Lin, C.-C., Schnurle, P., Chen, G.-Y., Liao, W.-Z., Teng, L.S., Chuang, H.-R., Wu, M.-S. 2008. Tectonic features associated with the overriding of an accretionary wedge on top of a rifted continental margin: An example from Taiwan . Marine Geology 255, 186-203, 10.1016/j.margeo.2008.10.002.